Another edition of the Great Backyard Bird Count is in the books, with a great showing for the birds and the bird watchers who joined in from around the world. As always, participants tell us they really enjoy this opportunity to do their favorite thing and contribute to science at the same time. Full results of the 21st annual GBBC here. The 20th was another record-setting year for the Great Backyard Bird Count. Explore the results here! Of course the 2016 Great Backyard Bird Count – the 19th – set records again for checklists submitted and species observed. Read the summary here! 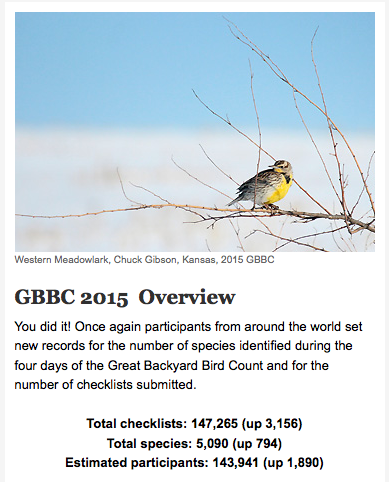 The results are in, and the 2015 Great Backyard Bird Count again set new records for number of species observed and number of checklists submitted! Check out the 2015 Photo Contest submissions.